Just look for "FreeRiverfrontParkWireless" network on your device and enjoy super-fast and free Wi-Fi from local Internet Service Provider, Pioneer Broadband. Tell your friends or just plain see for yourself. Donations via PayPal are accepted to help with upkeep of the gratis webcam and Wi-Fi services. You may want to check out the latest addition to the park, "The Camp", featuring burgers, fries, etc. and early morning coffee and donuts. The trailhead is located in the north side of the parking lot. The trail can be also accessed from the north side of the Highland Avenue Bridge following a wooden stairway. A mid-sized public parking lot is located in the Park next to the Meduxnekeag bridge. The non-motorized trail is a wide, graveled path running parallel to Meduxnekeag River. Hikers can walk for a round trip, or use it as a one-way connector trail connecting Highland Avenue Bridge. The park has a large, sheltered picnic area. A statue of a bear, sculpted by Forest Hart, sits next to the parking lot, greeting visitors to the park. From the park, hikers can walk across the Meduxnekeag River via the Gateway Crossing Footbridge, to Houlton's historic downtown Market Square. Around the Market Square, one can find many little boutiques and shops to stop in and make a purchase, have a latte, a snack, or just look around. The Gateway Crossing Footbridge also provides access to the park and the trail from downtown Houlton. In the park and along the length of the trail are a number of installed, educational plaques that have graphic illustrations and narrative explanations of local history and local wildlife and plants. Pets are allowed but their wastes must be removed. The park provides dog waste bags without charge. 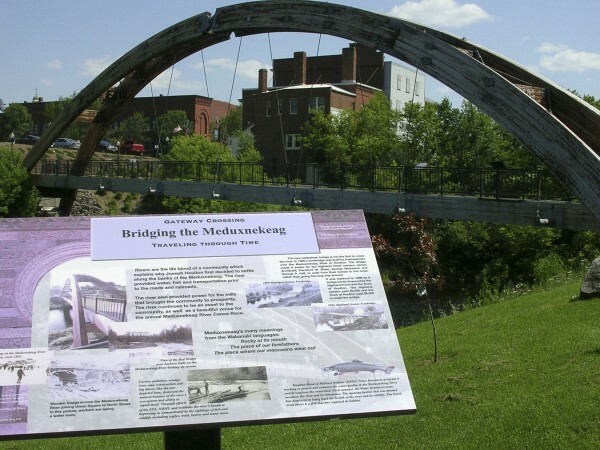 The Meduxnekeag Rverfront Development Committee, an adhoc committee of the Town of Houlton and Vital Pathways, Inc., has been instrumental in the development of the Riverfront Park with the connecting pedestrian bridge to Market Square. The project was initiated in 1999 and is now in its thrid phase of development. Current active members of the Riverfront Committee include: Bob Anderson, Committee Chair, Butch Asselin, Marie Carmichael, Don Collins, Wade Hanson, Dan Jacobs, Jane Torres, Tracy Tweedie, Otis Smith, Brian Stewart, and Lori Weston. The Gateway Pedestrian Bridge was constructed and opened in 2005. Future enhancements include a children's play area and public restrooms. The ability to control this camera's pan, tilt, and zoom features may be made available with a small donation. We appreciate donations to help with camera and Wi-Fi costs.